County Cricket Season 2019: Will Lightning strike twice for Lancashire? With the new cricket season on the horizon Lancashire will be keen to bounce back from the disappointment of relegation in 2018. Lancashire are favourites to win the Division Two Title having dropped out of the top-flight last year and will also be chasing one day success, so will it be a good year for the Red Roses? Few things herald the arrival of spring more than the sound of leather on willow and this year the action gets underway almost a week earlier than last season ahead of six months of high-octane action with Lancashire eager to return to Division One following the heartbreak of relegation last year. They begin their Division Two campaign with a trip to Lord’s on April 11 to take on the 2016 Champions Middlesex in what is bound to be a tough test for the Red Rose County as they look to bounce-back into the top-flight ahead of home matches against Northamptonshire and Worcestershire before a trip to Gloucestershire, and can be backed at 3.25 to win the title* at the first attempt. New signing Glenn Maxwell will be eager to start his Red Rose career having signed for the club at the end of 2018 he will be available to play up to five County Championship matches, the Vitality T20 Blast campaign and at least a section of the Royal London One-Day Cup and the all-rounder is one of three Australian signings arriving at Old Trafford along with Joe Burns and James Faulkner. With the Cricket World Cup taking place in England for the first time since 1999 several games will be played at out grounds to accommodate the international fixtures, enabling more fans to watch their sides play in more intimate surroundings and Lancashire will be making the short trip down the M62. They will take on Leicestershire at Liverpool Cricket Club in Aigburth on Monday June 3, their first visit there for five years, while the club’s players will also be using the venue as a training base at the end of June when the ICC takes over Old Trafford for the World Cup. Lancashire are no strangers to Liverpool Cricket Club having faced Leicestershire there last season with a crowd of over 4,000 turning up to see a thrilling game which ended in a last ball defeat for the Reds while they also played a Royal London One Day Cup tie at the same ground which they also lost. This will be the final season before the new 100 ball competition is introduced in 2020 and another change sees this year’s Royal London One-Day Cup competition taking place over a 38-day period during the first eight weeks of the campaign culminating with the final at Lord’s on May 25 while T20s Finals Day will now take place at Edgbaston on September 21. Following Lancashire’s relegation from Division One the only Roses clashes of the new season will come in the shorter form of the game with their first encounter with Yorkshire in the Royal London One-Day Cup at Headingley on Sunday April 21 ahead of two T20 meetings on Thursday July 25 in Leeds and Friday August 9 at Old Trafford. 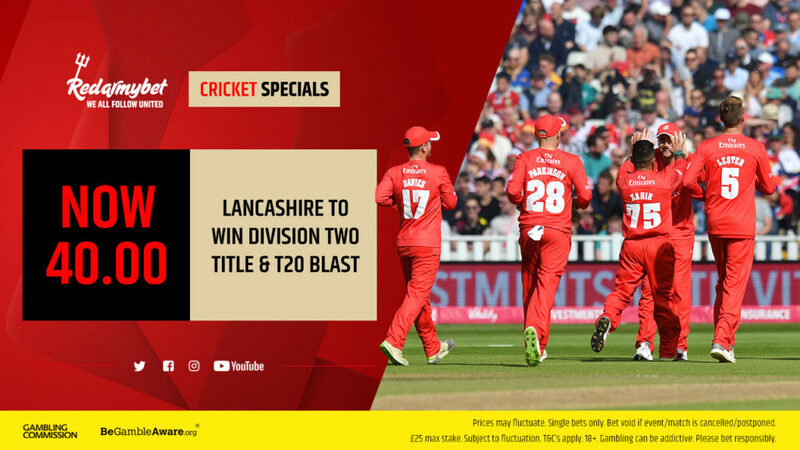 Lancashire can currently be backed at 11.00 to win the T20 Blast and as being regarded as one-day specialists might well be a good bet at that price, but will have to overcome the likes of favourites Surrey, who are 8.00 to win the tournament* for the second time and current holders Worcestershire, who are 15.00* to repeat their 2018 success.